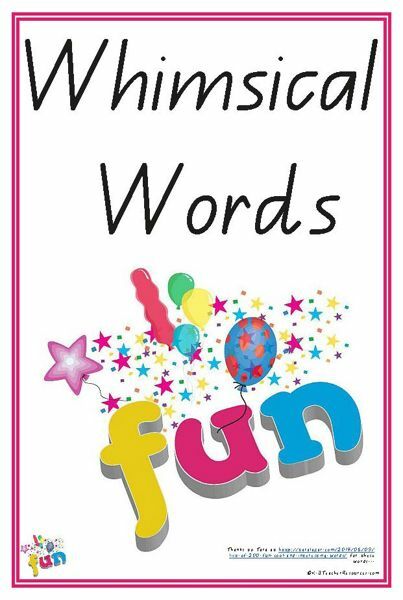 52 Fun and Whimsical Words to use in your writing and just to play around with! I was searching for words that are fun to say – with interesting sounds and letter combinations – I love this sort of thing and so do kiddies – no matter what age – REALLY – KIDDIES OF ANY AGE – looooove playing with these types of words and get so much out of them. Please don’t be afraid to introduce them – you could even do one a day or one a week or just have them available on the wall for your littlies to investigate and play around with – before you know it – they will be using them in their writing and picking up on more interesting words in their reading. Credit for these words goes to Tara Lazar and her 250 cool words list http://taralazar.com/2014/06/09/list-of-200-fun-cool-and-interesting-words/ – a wonderful author and a wonderful list of words to play with…. Find out their meaning – introduce one or two each week – play around with them as a class – find out their meaning, rap their spelling, clap their syllables – look for all those great sounds and letter combinations that they have. Before you know it they will using them in their writing. Add more Whimsical Words to the spare cards as children come across them in their reading….and expand the display for writing reference. Cool words to use for sizzling starters in narrative and persuasive writing……love them!